BEST SNORKELLING in Fiji is at Mantaray Island Resort! Mantaray Island has the best snorkelling in Fiji literally ten metres from the shore line. We might be a bit biased, we think we have the best island in Fiji hands down! Fiji is known as the soft coral capital of the world, and with good reason. It is made up of over 330 islands surrounded by stunning turquoise waters. Fiji is a mecca for snorkellers. In Fiji’s waters, columns of coral seem to erupt from the depths, stretching their colourful limbs toward the surface. These reefs are home to starfish, anemones, manta rays, reef sharks, morays, octopus, butterfly fish and so much more! Plunging your face beneath the surface of these warm waters, you’re bound to forget the world above sea level for a few breathless moments. Why Mantaray is the Best Snorkelling in Fiji? With so many islands and so much to see it can be hard to pick where to start. Fortunately, Mantaray Island Resort is here to make it easy by proudly claiming the “Best snorkelling in Fiji”. Mantaray Island has the best snorkelling in Fiji literally ten metres from the shore line. The marine life really knows how to put on a show! 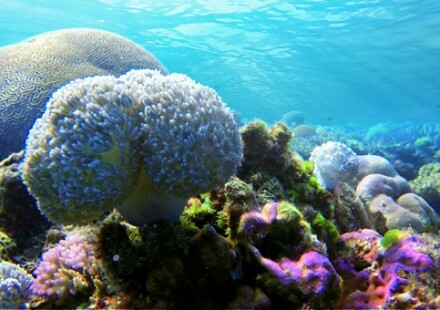 Our beautiful reefs are totally encompassed in a vivid rainbow of soft and hard corals. Add to that swirling clouds of bright blue anthias and the glistening of green and purple parrot fish. And that’s simply the appetiser as you first enter the water! Then the real fun begins. 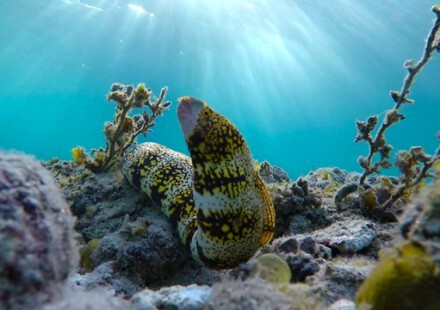 Search the crevices of the coral for the elusive Mantis Shrimp or the quirky pipe fish. Discover a family of clown fish nestled in the safety of their anemone. 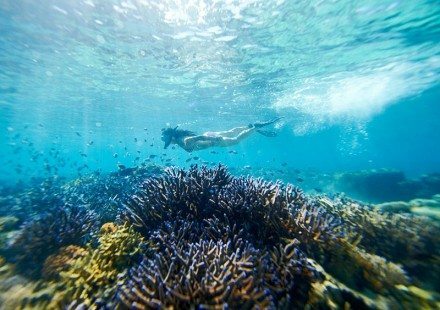 What makes snorkelling at Mantaray Island Resort so unique? We have more marine biodiversity per square meter than any other known reef in Fiji. 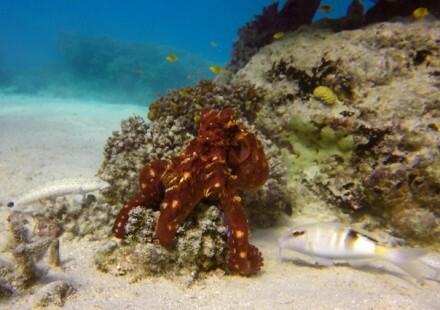 This means that you can see an incredible array of different marine species in a small space. The reef has been a voluntary marine reserve since 2003 and a formally gazetted marine reserve since late 2012. This means there’s been no fishing in the Mantaray Island reserve for more 14 years now. As you can imagine, a tropical marine environment that has been nurtured for a long period of time really begins to flourish. Mantaray Island Resort is the proud home to thousands of marine species. With resident morays, sharks, octopus, stingray, seahorses, pipefish and many more. If you want a truly jaw dropping experience, come to Mantaray Island Resort. 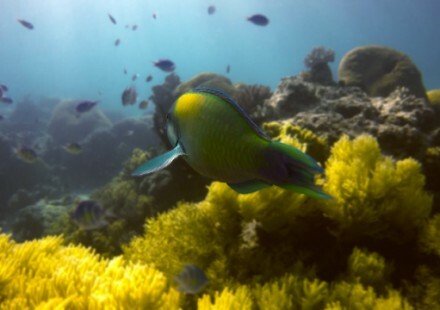 Enter the reef directly in front of the resort to see flourishing coral and countless species of fish. Mantaray Island Resort has been a voluntary marine reserve since 2003 and a formally gazetted marine reserve since late 2012. This means there’s been no fishing in the Mantaray Island reserve for more 14 years now. We do ask that you don’t walk on any exposed reef during low tide, ask our Activities Staff to show you where to enter the water if you wish to swim at this time. One off fee applies for the duration of your stay for mask/snorkel/fin hire.